Jeanne van Heeswijk works with people. Her socially engaged practice shows her ongoing commitment to working with communities; to instigate social awareness and effect change. For the past two and a half years she has been working with the community in Anfield, Liverpool; an area targeted for major regeneration in 1998 and in recent years hundreds of homes were cleared for demolition, in anticipation of multimillion investment. 2Up 2Down sees people being empowered to re-imagine the area, claiming the right to live well. A group of more than 20 young people are working with architects and other design specialists to re-use a block of empty property comprising a former Mitchell’s bakery building and two adjoining terraced houses. 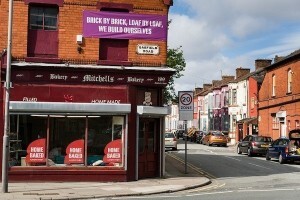 At the same time, a cross-generational group of local residents have set up Homebaked Community Land Trust – a co-operative organisation with its roots in the garden city movement – to enable the collective community ownership of the properties and to reopen the Bakery as a social enterprise. Visitors are invited to join the Anfield Home Tour on Saturdays to the 2Up 2Down project base at the former bakery. The tour presents the impact that regeneration has had – and still has – on the lives of people in the neighbourhood; and is an inspiring, intimate way to see the project.